Eastern Fire & Rescue Service is a small but dedicated team of Fire Marshall's/Firefighters. We also hold First Aid qualifications and some of our crew are ex-firefighters from Suffolk. We have years of experience of film set fire cover with major films across the south east of England. We also have experience of covering big public events such as music in the park in Ipswich and the beer festival in Ipswich, We also join up with our colleagues from Norfolk who also cover these events alongside of us and who also have a very wide range of crew members from ex-firefighters from London and Norfolk. This is our Dennis Rapier MK1 with a 8.3 Litre straight six turbo Cummins engine which produces 250 break horse power. 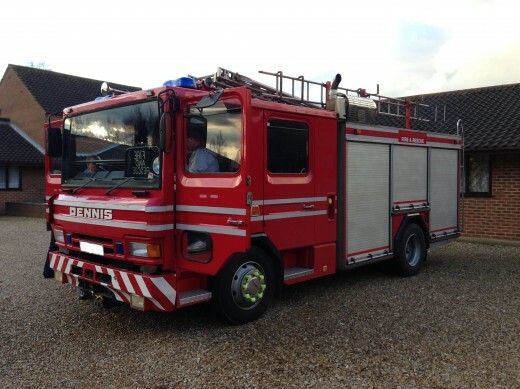 It is equipped with a 1000 GPM Godiva pump and is supplied by the 1800 litre tank. The appliance also has a front mounted winch. This is our Land Rover Discovery 200tdi which has been converted into a support vehicle and is equipped with a 2" Honda water pump and hose with extinguishers. It makes a great support vehicle with its 4x4 capability which allows it to get to places that may be unreachable by our full size machine. We pride ourselves in delivering a simple but efficient and effective service to our customers to fit the needs of their event. We can cover a wide range of events, regardless of size, location and terrain. 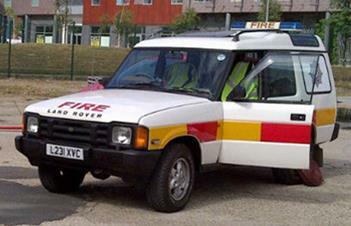 We are usually available at short notice, and cover can range from fire extinguishers to fire appliances and crew. Please feel free to ask and we will do our best to help.